Learn new tricks, progress in the park, and ride with a group of like-minded ladies! 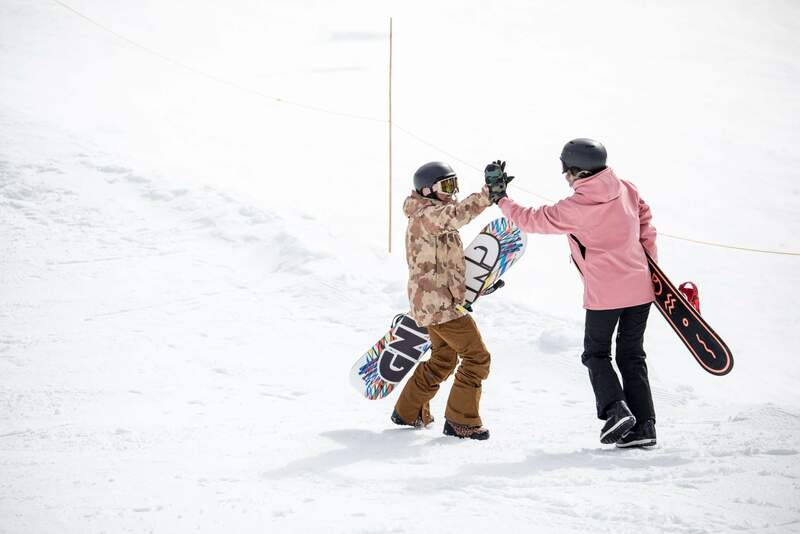 Beyond the Boundaries Women’s Snowboard Camp is coming to Beech Mountain Resort on February 2-3, 2019. Whether you are totally new to the park or are a freestyle veteran, BTBounds’ professional rider coaching staff will help you learn new things, increase your confidence and have fun! Drop into features in a private progression park—the perfect place to hit your first box or dial in tricks on a street-style rail. This is the ultimate shred weekend designed just for the ladies! Please contact info@skibeech.com for more information about season passholder discount. Beyond the Boundaries women’s snowboard camps are freestyle-focused experiences perfect for all levels of snowboarders. If you have never been in the park before, our staff of professional coaches will be there every step of the way as you hit your first box. Familiar to the park and looking to add to your bag of tricks? We got you, girl! We will help you step to street-style rails, perfect your front three, or master switch Euro-carving and on-trail tripods. At each camp, BTBounds is lucky to have our own private park with beginner-to-intermediate sized jumps, box, rails, and more that are perfect for every level of rider to learn new tricks.